That was great! I loved the "I hope they don't hit a piece of glass" comment at the end. Why is that always the first thing they go to? You're famous! That is such an awesome clip! I love that you're in Canada (I'm in Ontario). 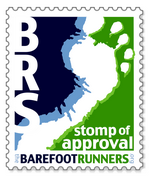 Great way to promote barefoot running.